Breath of the Wild’s Champions’ Ballad DLC released last night. There’s a lot going on and it can be hard to know where to start. But once you dive in, you’ll find some of the game’s best challenges. When you first start up the DLC, you’ll get a handful of quests added to your journal. Many of these will guide you towards finding new outfits and armor. If you follow these, you will be able to find Zant’s helmet, Phantom Ganon’s armor, Ravio’s hood, and a royal guard’s costume. Most importantly, you be able to find Link’s lobster pajamas from The Wind Waker. There is also a quest for an ancient bridle and saddle for your horse, which makes it easier to teleport them right to you and spur faster. Your journal will send you to a few locations to speak with locals or find journals with hints leading to these items. There’s also a gosh dang motorcycle but it will take a little longer to get that. You’ll have to complete all of the Champions’ Ballad quest. Which is a doozy. In order to access the Champions’ Ballad quest, you will need to complete all four Divine Beasts and the quests surrounding them. The latter part is the most important; it’s possible to complete a Divine Beast without actually finishing the quest. If you have cleared all the dungeons and don’t receive the quest, check your journal and make sure you’ve finished the quests themselves. When you’ve done that, you should hear a message from Zelda telling you to go to the Shrine of Resurrection. Go back, place your Shiekah slate in the terminal you find there and you’ll start up the DLC. 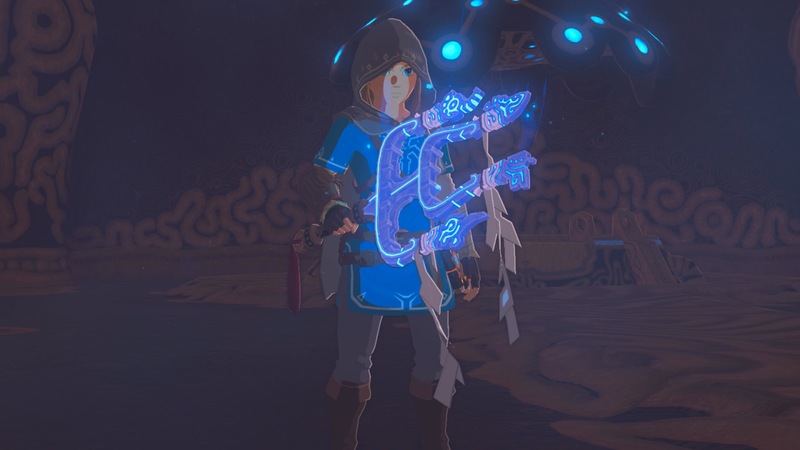 The initial part of the DLC mixes together many of Breath of the Wild’s strengths including exploration, dangerous combat, and really good shrines. You’ll receive a “one-hit obliterator” that saps all of your hearts down to a single quarter heart unit. This means you’ll die from anything in one hit but the trade off is that the obliterator will defeat any monster in a single strike as well. There will be four objective markers showing enemy camps; you will have to clear out these camps to explore four new shrines. While the obliterator is useful, it only has a few charges before you’ll have to back off and wait for it to power up. My advice is to stock up on arrows and use stealth to clear out smaller enemies before charging tough ones to smack with the obliterator. One of these camps in on a high mountaintop too so cook some food or dress accordingly otherwise the cold will kill you. The second part of the quest will take you all over the world. The shrines are delightful and I won’t spoil them here. When you complete all of them, the obliterator will shoot energy that lands in four points on the map. This is the second phase of the DLC and it’s surprisingly long. Each of these locations bears a small altar depicting images of where to go next. Every altar shows locations and you will have to complete tasks at each one to unlock more shrines that will eventually allow you to learn more about Hyrule’s past and the Four Champions. For instance, one of the Urbosa locations left me in the desert where I had to slay a massive Molduga before entering a shrine with a very tricky electricity puzzle. Completing these shrines will draw you back to the corresponding Divine Beast where an illusory version of the dungeon’s boss lies in wait. Your weapons are limited in these fights and you’ll have to figure out how to use your arsenal to defeat the boss. It’s not the most challenging task but Champions’ Ballad remixes and reshuffles abilities and items to add some new twists to familiar battles. I’m still working my way through the DLC and will share more will you as I progress. The item quests are no longer than what the first DLC offered but Champions’ Ballad’s main quest is much longer. This second phase can feel padded but if you stick with it, you’ll find yourself exploring the world and engaging in a variety of tasks including some of the game’s best puzzles. Go into it with an open mind and try to avoid guides. Champions’ Ballad is a chance to relive some of the magic that makes Breath of the Wild so wonderful to begin with.